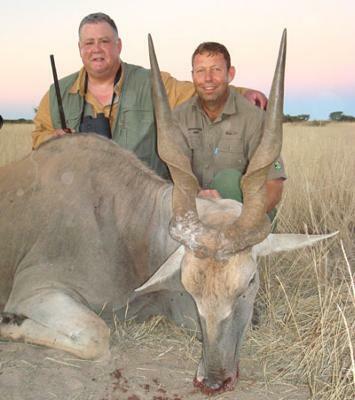 In 2008 I contacted Michael Duvenhage of Uitspan Hunting Ranch in the Kalahari of Southeast Namibia about the possibility of hunting a trophy size Eland. Michael said that Uitspan has a good quantity of excellent Eland bulls and I would have a good chance of harvesting a trophy. I agonized over what rifle to take for the Eland. I had a Ruger "African" .375 Ruger which would surely do the job but this rifle had an excessive amount of recoil. I finally decided on my trustworthy Ruger M77 .300 Win Mag. The .300 Win Mag would allow my to take many of the smaller animals besides the mighty Eland with reduced recoil. In May of 2009 I was met at the Windhoek Airport and escorted to Uitspan by Michael and his wife, Tienie. After such a long period of correspondence it was wonderful to actually meet the Duvenhage's. I also met young Jan-Hendrik, little Isabelle and later on I met eleven year old Maria. They are exceptionally bright and beautiful children. When I arrived at the hunting camp about 450 yards from the Botswana border, I unpacked and had a cold glass of borehole water from deep beneath the Kalahari sands. Michael said it was time to go to the rifle range and see if I could shoot. I was eager to pull the trigger on my rifle. We went to a large pan which is a flat area that fills with water during the rainy season. The pan was dry at this time of year. The pan serves as a rifle range and an airfield for small planes that bring hunters to Uitspan. There was a small cornfield by the side of the pan which Michael said was used by Eland. Across the pan, perhaps one thousand yards away, was a waterhole. Michael spotted a herd of Eland at the waterhole. There was also a herd of Gemsbok. The herd of Gemsbok quickly ran off into the hills surrounding the pan. The Eland remained. Michael said the Eland herd consisted of about five cows and three big bulls. He said the bulls had come from Botswana and he had seen them frequently by the pan eating corn. Two of the bulls were very nice, indeed, but it was a large blue colored bull with a massive dewlap that almost dragged on the ground that Michael pointed out to me. I assured Michael that my rifle was sighted in properly. I wanted to go after the blue bull. Michael said that we could attempt a stalk even though there was not much vegetation to hide behind. to 750 yards of the blue bull. We started to move to the left to gain the concealment of a large Acacia Tree. We crouched by the tree about 350 yards from the blue bull. It was becoming dark. My scope picked up a lot of light. I could see the blue bull in my crosshairs but the distance was too great to try a shot. We crouch-walked another 150 yards. The blue bull disappeared in the trees and our exciting stalk was over. Michael shook my hand and said he would always remember the stalk over barren ground. We went to the camp and met Hendrik snr and Michael's brother-in-law, Neil. We had a cold Windhoek Lager while sitting by the large firepit. We had Kudu steaks for supper. Micheal said we would search for the Eland herd tomorrow. I slept well in my luxurious accommodations and dreamed of Eland with large horns and large dewlaps. I awoke the next morning to the sound of Michael crowing like a Rooster. Then I had biscuit and tea for breakfast. We started out that day looking for Eland but ran into a herd of Gemsbok. I harvested a 40.5 inch female Gemsbok, a true Kalahari trophy. That night we had Gemsbok steaks for supper. In the morning we would once again hunt Eland. The next morning was a bit chilly. I awoke to the sound of the Rooster and had biscuit and tea with cream. Hendrik called and said he had seen a nice Eland. We found the tracks of the Eland in the red Kalahari sand and followed them. During the hunt we saw many animals including Kudu, Gemsbok, small Eland and Giraffe. The Kalahari is a paradise with it's wealth of wild animals. We followed the Eland tracks for miles. Then, we got very close. The Eland bull; not the blue bull, came out of the trees on the right at a gallop. I executed a running shot and shattered the bull's hip. The bull slowed down and I put the finishing shot into him. He was a magnificent bull. He was in his prime. His horns measured 39.5 inches with an overall score of 262cm. 210cm is Namibian Gold so you can see that this was an exceptional animal; one of the top 20 from Namibia for all time. There had been a full moon the last few nights. Tienie said that they enjoy the marrow from animals in the Kalahari. She said that the marrow is best during a full moon. That night we roasted the marrow bones from the Eland on the fire. Tienie stuffed a marrow and garlic mixture into the large Eland tenderloins. The tenderloins were roasted over the fire. Nothing can beat a cold Windhoek Beer enjoyed with good friends sitting by a Camelthorn fire and eating Eland tenderloin and marrow. I was very happy. I had just experienced a wonderful hunt with great people in a beautiful land. I was content. Surely an animal like this is not killed only for the horns. What about the skin and the meat?? Great story about the different kinds of animals in Africa. The different kinds of steaks sounded good. The kind of food that you would not get over here. Steve should start a steak house. Beautiful story, and a beautiful picture. Congratulations on your trophies. A Great Story about a hunt for a magnificent animal. Uitspan has awesome trophies available! The picture is Great also and the marrow stuffed tenderloin really makes the mouth water. ONCE AGAIN I AM NOT DISAPPOINTED. I FELT LIKE I WAS ON THE SAME HUNT. THANKS FOR THE DETAIL FROM BEGINNING TO END. GREAT SHOT ON A MOVING TARGET, THANKS FOR THE CLEAN KILL AFTERWARDS. THE BREAKFAST THE STEAKS AND THE FRIENDSHIP ARE SOMETHING THAT COULDNT HAVE BEEN BOUGHT. YOUR STORY IS NOT JUST A HUNTING TALE BUT A GREAT LIFE EXPERIENCE. KEEP US INFORMED AND DARE I SAY NEXT TIME THE TROPHY WILL BE IN THE TOP FIVE. I want to taste some of that marrow. Good hunt and good food! A taste of heaven indeed! Nice Eland Bull. Sounds like a great time. Would have liked to have tried the marrow stuffed tenderloin, bet it was good.